Summer is just around the corner. Is your tutoring business ready? Traditionally, summer marks some of the year’s leanest times for tutors and test prep companies. That said, some strategic planning can ensure your business not only survives the slower months but thrives. Before making any strategic plans, figure out what staff you will have at your disposal. Just as summer is a common transition time for students and families, educators often wait for summer to make major changes in their own lives and careers. Talk with your tutors and other staff members now to figure out who will be available for work over the summer. If some seem leery of committing, play it safe and don’t depend on them when structuring your business for June, July, and August. There’s nothing worse than lining up clients and then finding out you have no one available to tutor them! Once you know which staff members are available to work, figure out how available they really are. Odds are both you and your team want to get out and enjoy the summer as much as the students you support do. Create a calendar to keep tabs on vacations and overall staff availability (including your own!). Summer is probably the time you can best afford to both grant and take personal time off – demand and stress levels will be much higher come the fall college application season! Encourage staff members to be honest and upfront about their planned time off to help avoid last minute, unexpected cancellations due to bogus illnesses or convenient “emergencies.” Being inflexible about time off during the summer months could drive away quality tutors who simply need a break. Reach out to your staff and prospective summer clients to get an idea of the days and times that will be the best fit for test prep sessions. With the school hours back in play, you may find that mornings or mid-day sessions are more popular than the usual after-school or evening time slots. Furthermore, you will likely see increased demand for mid-week availability. Especially in the summer, families often aim to keep long weekends free from commitments. Take the aforementioned staff and client feedback into account and establish a summer operations schedule that makes sense. 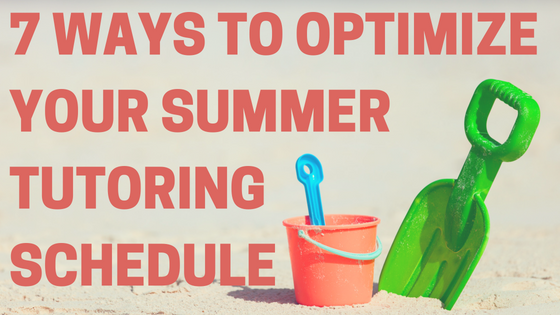 If it turns out that nailing down a consistent summer calendar is a challenge, there are ways to use the flexibility of summer vacation to your advantage. If you are offering summer tutoring packages (which you should! ), consider building in “drop-in” sessions. Much like the way college professors offer office hours, these open sessions allow students time with their tutors for additional support or feedback when it is both necessary and convenient. Not only does this make it easier to maintain a productive workflow around disruptions and vacations, but it also adds another marketable layer to your test prep offerings. Similarly, online tutoring allows students the opportunity to continue their learning on the road or at times when the tutoring center may not be open. Online tutoring is not only growing in popularity, but it also allows for uniquely advantageous learning conditions. If successful, it could even open up new markets outside of your company's local reach! This summer may be a great time to fold an online tutoring component into your test prep portfolio. Don’t know where to start? Clear Choice Prep has you covered with its comprehensive ACT and SAT prep content and software that make the transition to online learning easy! Schedule a demo to see first-hand the impact our 100% custom-branded products can make for your test prep business! Recruiting and retaining clients over the summer is challenging. Remember: your test prep business isn’t the only one preparing for a slower season! Get in front of your local competitors with summer discounts. Offering competitive tutoring packages and reducing prices for early-bird registrations can position your tutoring business as a more viable option than the alternatives in your area. Moreover, filling up your summer rosters now will make it easier to plan for the staff and operational schedules you will need during the season. Perhaps the most underrated part of planning for your test prep business’s summer is how it can affect your upcoming school year. Consider the fact that the new clients you attract and the new systems you put in place during the summer can set the table for a strong fall. Summer doesn’t have to be a wasted season for your test prep business. Make the right moves and build the momentum that will put distance between you and the competition come fall. Clear Choice Test Prep is here to help!